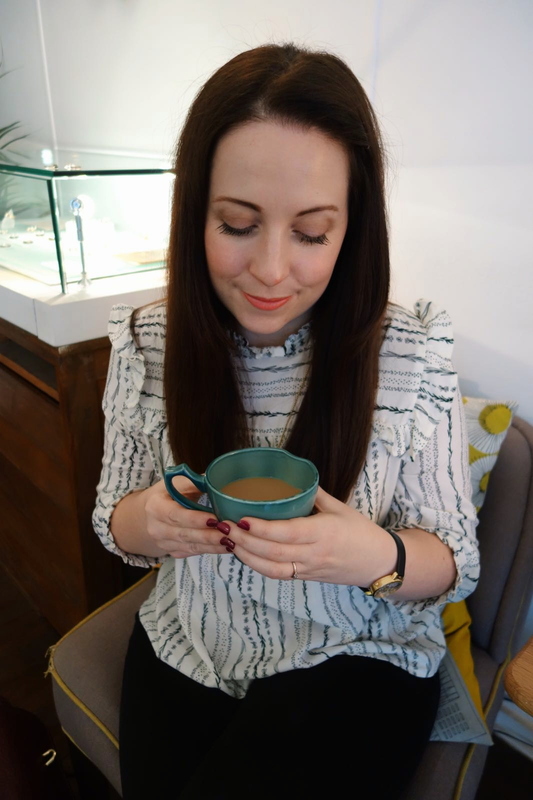 Most people won’t know that The Lowry is where John and I spent our first date – it’s our best kept secret, albeit unintentionally. On a cold, frosty Sunday morning, back in 2013, we nervously strolled along the quays until the warmth of The Lowry enveloped us and there we sat; two people pretending to observe the artwork of its namesake, making small talk and stealing fleeting glances at each other. I look back with fondness and remember that feeling of nervous excitement. Because of this day, over four years ago, The Lowry holds a special place in my heart. When we were offered the chance to review the pre-theatre menu at Pier Eight – The Lowry’s restaurant and bar, before watching Cabaret, John and I earmarked the evening as date night. As we’re marrying next year, it’s unsurprising that date nights are becoming few and far between so primed for an evening of nostalgia, I chose the dress I wore on our second date and we set off to make our 5.30pm reservation. Named after its address on Salford Quays, Pier Eight offers a contemporary and modern dining experience and its waterside setting overlooks Salford Quays and its impressive Millennium bridge. On arrival, we were seated next to the window, which must be the best seat in the house during the summer months, but on a dark autumnal evening I asked to move inwards to a seat with better lighting. It was fortunate that I asked early. We were accommodated at a central table, and whilst in the process of choosing from the menu the restaurant filled with pre-theatre diners, just like us, chatting excitedly about the plot line of Cabaret. With five options, the starter menu provides plenty of choice. I eventually decided to be adventurous and try something new in pressed confit chicken & duck, lentil dressing, warm rye crumb with a mushroom ketchup. John opted for seared scallop, pancetta, pork dumpling, caramelised cauliflower puree, crispy sage and apple sauce because he’d simply never tried them before and wanted to choose something different. When our food arrived, I was not only impressed by its presentation but with the variety of flavours and textures. The rye crumb was an intriguing inclusion, providing a crunch alongside the velvety confit. John was equally as impressed with his seared scallops, but not before he captured his starter – proving his weight as an Instagram husband-to-be. He was surprised at the taste of scallops, saying they were meaty not rubbery and would definitely choose them again. For our main course, we both chose the lamb rump with sweet potato, Savoy cabbage, onion puree and lamb jus with a side portion of chips. Again, when our food arrived, the presentation impressed us. The lamb was cooked to perfection in that it was hardly cooked at all. Rare enough to be flavoursome, but not oozing blood all over the plate. John compared the look of the sweet potato to an eighties’ croquet, but it was soon gone. Surprisingly, so was the Savoy cabbage – when I cook it at home, it gets pushed around the plate. High praise indeed. Wonderfully hearty and comforting, the main was my favourite dish. I was instantly drawn to Grandpa Greene’s ice cream with vanilla waffles, I think after such a rich starter and main course I was seeking a classic flavour palette. Again, presented beautifully but I found I was chasing the ice cream around its silver dome. A mixture of favourite flavours, the ice cream went perfectly with the waffles which contained only the slightest hint of vanilla. John chose peanut butter and raspberry cheesecake with a peanut cluster, which he thought was a strange combination of dessert flavours at first, he found the taste slightly strange to begin with but soon developed a taste saying he could eat it again. Nice try, John. It’s no surprise that this was John’s favourite course. Too full to fit in your dessert? An interesting quirk of pre-theatre dining is that you can enjoy your desserts, cheeses or ice-creams with drinks or coffees during the performance interval – you just have to let your server know. This is something we didn’t choose to do, but during the interval, I wish we had! We chose three courses from the pre-theatre menu, at a price of £27 per person with a £5 supplement each for the lamb rump and felt this was good value for money. We found our waitress to be friendly, informative and attentive, but not overbearing. Our plates were quickly taken away and the service was extremely efficient, any breaks between courses was at our own choosing. We wouldn’t hesitate to return, or recommend it! Location: Pier Eight, 906 The Quays, Salford, M50 3UB. For the pre-theatre menu, you can book your table when you select your theatre ticket by visiting The Lowry’s website, here. Interested in seeing a show? Read more of my posts featuring The Lowry: The Wind in the Willows and Jane Eyre.